A New York Times editorial argued that the U.S. should consider the climate implications of constructing pipeline, like Keystone XL, to transport bitumen from the oil sands in Alberta. As should Canada. The carbon emissions embedded in bitumen that would be transported by the proposed pipelines across BC would not only dwarf the emissions from the province itself, as I discussed last week. It would completely undermine not just B.C. 's emissions reduction policy, but the entire country's policy. The graph shows the estimated gap (i.e. necessary reductions) between the most recent national emissions estimate (2010, 692 Mt) and the policy goal for 2020 (17% reduction, ~607 Mt). 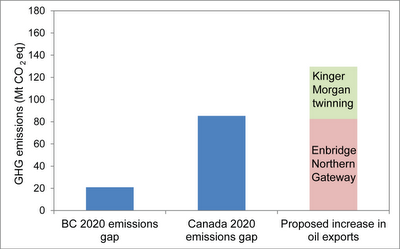 The emissions embedded in the proposed Northern Gateway pipeline (82.5 Mt) is alone almost as great as the Canadian 2020 emissions gap (85.3 Mt). Add the Kinder Morgan twinning, and the carbon emissions embedded in using the pipelines would make a mockery of any efforts to reach the federal target. We'd be reducing emission from the country, but increasing emissions in other countries. 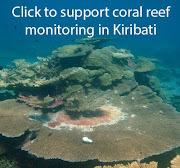 The climate does not care whose balance sheet lists the carbon. Maybe if the federal government wants to referee this growing inter-provincial battle over the pipelines, it needs to be willing to talk climate. Posted by Unknown at 2:29 p.m.